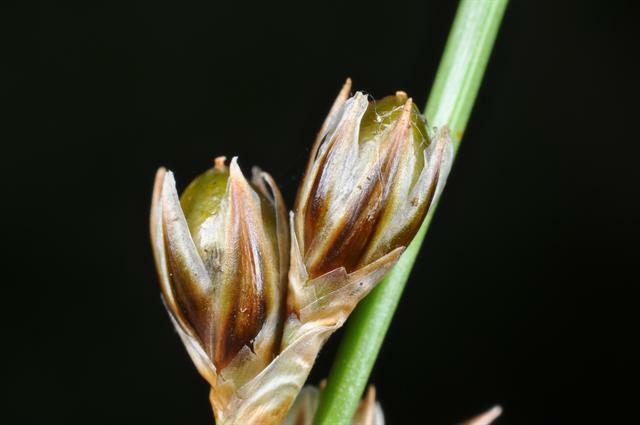 Juncus squarrosus Foto © Biopix- JC Schou.biopix.nl (Accessed 6/2015). Juncus is a genus of grass-like or sedge-like herbs, stems round in cross-section (not triangular). Leaves few to none, with or without blade, sheaths open. Flowers with both stamens and ovary (perfect); 3-parted, petals and sepals in two separate whorls, alike, stiff, thin, dry (chaffy), narrow, pointed; stamens 3 or 6, stigmas 3; flowers often in tight rounded head-like clusters (glomerules); inflorescence branched; wind pollinated (Michalski and Durka 2010). Fruit dry, capsule surrounded by old flower parts; seeds usually numerous.